Accidental spills of harmful pollutants are a nightmare, not only for companies involved but also for scientists who come up with ways of cleaning up the environment. Bacteria are major role players in this effort, but the problem is that they are fragile and might not be able to proliferate and do their job if they themselves get poisoned by high concentrations of the pollutant. Scientists in the field of bioremediation are looking into new ways to protect the bacteria, leaving it to carry on with the dirty work of eating up the pollutants. Sol-gel technologies have been proposed to make environmental clean up faster and more efficient. So-called sol-gels are formed from small, soluble molecules in solution (sols) that bond together to form a solid (gel), trapping anything large enough within itself during gel formation. By trapping bacteria in a sol-gel, the bacteria become localized in one area, effectively concentrating them. The entrapment could serve to improve the survivability of the bacteria, as protection against the sometimes harsh conditions within toxic spills. Viability of the bacteria is further improved by entrapping the bacteria along with protective molecules. Scientists make sol-gels in several ways from different metal oxide precursors. Recently, an efficient way of controlling sol-gel properties (such as porosity and thickness), was shown using electrochemistry and applied to bacteria entrapment. Electrochemically-assisted synthesis of sol-gels onto a conductive surface takes only a few tenths of a second and has been documented to last for days without collapsing. This fine control of the films could make this technology suitable, not just for bioremediation, but in commercial bioprocesses, antibiotics production and in pharmaceutical industries. By adding nanomaterials such as carbon nanotubes to the sol-gel film, scientists are also investigating whether this approach can help expand applications to biosensors as well, a useful approach in monitoring the pollutants as they degrade. Editor’s note: It is just this area of science that postgraduate student Lwazikazi Madikiza is examining for her PhD in Biotechnology. 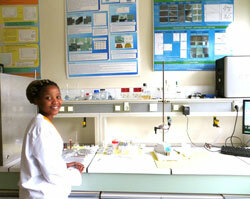 Working with Prof Janice Limson at Rhodes University’s Department of Biochemistry, Microbiology and Biotechnology, Lwazi is currently getting all the hands-on she needs for this part of her studies in the laboratory of French researcher Dr Mathieu Etienne. As part of a France-South Africa Research Cooperation programme, Lwazi is based in Nancy at the University of Lorraine’s CNRS facility for a month.